The songs of Ron Abel and Chuck Steffan will be presented Nov. 22 at Birdland. Entitled Who The F*#! Are These Guys, The Songs of Ron Abel & Chuck Steffan, the evening will include the composers as well as special guests Lucie Arnaz and Valarie Pettiford. Show time is 7 PM. Composer, arranger, orchestrator and producer Ron Abel and lyricist Chuck Steffan's new shows are Bombshell, the story of Hollywood love goddess Cleo Moore, the Queen of the B-Movie Bad Girls; Presenting Laurette Bishop, celebrating the return of one of the greatest jazz singers you never knew; and undressed, a new and raw telling of the novel “Camille” by Alexander Dumas fils. Birdland is located in Manhattan at 315 West 44th Street. For tickets, priced $30 and $40 with a $10 food/drink minimum, call (212) 581-3080 or visit www.BirdlandJazz.com. 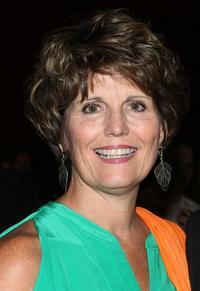 Veteran stage and screen actress Lucie Arnaz will host The 14th Annual AB*IE Awards, a celebration of the Abingdon Theatre Company's 2009-2010 season, at the June Havoc Theatre Sept. 13 at 6:30 PM. The event, which includes pre- and post-show receptions, is free and open to the public. No reservations are required. The favorite production, director, cast members and designers from the productions that made up the company's 17th season will be chosen for the awards, which were voted by theatregoers. Eligible productions include Robert Cary and Benjamin Feldman's Inventing Avi, directed by Mark Waldrop; Jan Buttram's Phantom Killer, directed by Jules Ochoa; John Morogiello's Engaging Shaw, directed by Jakob G. Hoffman; and Stephen Swift's Sister Myotis's Bible Camp, directed by Jerre Dye. Arnaz has appeared on Broadway in Dirty Rotten Scoundrels, Lost in Yonkers and They're Playing Our Song and in The Witches of Eastwick in London. Additional stage credits include Master Class, Seesaw and Annie Get Your Gun. A Golden Globe Award nominee for her performance in "The Jazz Singer," she won an Emmy Award for "Lucy and Desi: A Home Movie," a documentary about her parents, Lucille Ball and Desi Arnaz. The June Havoc Theatre is located at 312 West 36th Street. For more information, call (212) 868-2055 or visit www.abingdontheatre.org. 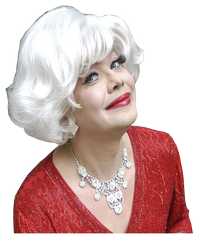 Richard Skipper, the 4-time MAC Award winning celebrity tribute artist, brings his critically- acclaimed show "Carol Channing" IN CONCERT to Cape Cod for a 4-Night Only Special Engagement prior to this Fall's Off-Broadway run. A portion of proceeds from each ticket will benefit The Dr. Carol Channing & Harry Kullijian Foundation For The Arts. The performances will occur Monday August 30th through Thursday September 2nd at The Madeira Room Vixen located at The Pilgrim House in Provincetown. "Carol Channing" IN CONCERT is a fully staged and researched musical montage celebrating the career and persona of the unique theatrical legend. Blending Channing's standards with original material and other familiar songs sung by Skipper in a spot-on Channing-on-Broadway perfection, the musical evening surveys Channing's life with many stops along the way for Skipper's unique--and riotous--"ad-lib" interactions with the audience is accompanied by a 3-piece band. The show is directed by long-time NYC actor/director Mark Robert Gordon. Making his return to Provincetown for the first time in 8 years, Skipper is fresh off a joint appearance with Carol Channing preceding a 1-night standing room only engagement of "Carol Channing" IN CONCERT in New York (a star-studded event with luminaries such as Oscar-winner Celeste Holm, Betsy Palmer, Joe Franklin, original Broadway Hello, Dolly! cast members, and Channing songwriter Ervin Drake in attendance). The buzz created by the New York concert has prompted demand for a longer-term Off-Broadway production, which is slated to open in New York City this Fall in conjunction with bookings worldwide. The Provincetown and upcoming Off-Browadway productions of "Carol Channing" IN CONCERT are produced by The Camelback Kid. Richard Skipper is a 4-time recipient of the MAC (Manhattan Association of Cabaret) Award a Back Stage Bistro Award, and a CLONEY AWARD in Las Vegas for best performer. He was named as one of the Top Ten Cabaret Performers by Cabaret Hotline and as one of the Top of the Century Premiere Cabaret Acts by Cabaret Scenes Magazine. "Carol Channing" IN CONCERT runs 4-nights only from Monday August 30 through Thursday September 2 at 9:00pm at The Madeira Room Vixen located at The Pilgrim House, 336 Commercial Street, Provincetown, MA. Tickets: available in-person at The Madeira Room Vixen box office or at (508) 487-6424. Further information is available at www.thepilgrimhouse.com, www.ptownvixen.com, www.TheCamelbackKid.com, and www.RichardSkipper.com. Tickets are $35.00 ($30.00 if advance purchased). A portion of proceeds from each ticket benefits The Dr. Carol Channing & Harry Kullijian Foundation For The Arts. Running time is 1 hour 20 minutes (no intermission). The show is suitable for all ages. Thursday evening may have marked the end of the Lucille Ball-Desi Arnaz Center series of comedians, "Laughter on the Lake," but it is also a clear sign of a new beginning for the center, according to board president Tom Benson. "The board is committed to an aggressive expansion plan for the center that will see the strengthening of its Lucy Desi Museum and I Love Lucy Playhouse operations and the development of an over-arching Legacy of Laughter program that will be designed to promote comedy and laughter on a much broader scale," Benson said. "We want to preserve the incredible contributions of Lucy and Desi through the transformation of Jamestown into the Comedy Center of America. 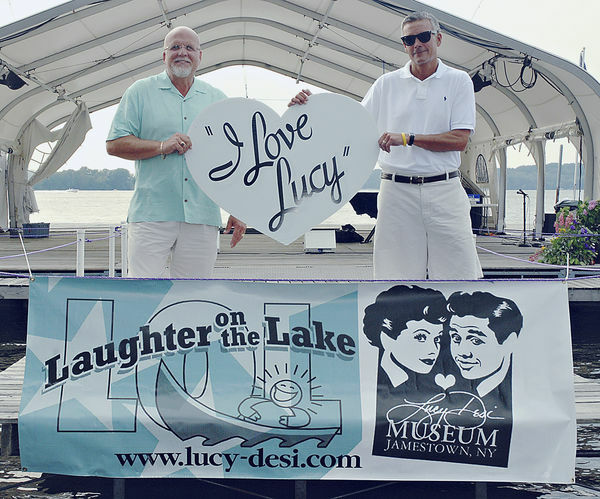 Dan Dalpra of Bemus Bay Pops, left, and Tom Benson, president of the Lucille Ball-Desi Arnaz Center board, promote the partnership that resulted in Laughter on the Lake. The Legacy of Laughter platform will have four segments. The first will be the Legacy of Laughter Award and Hall of Fame. This award will be given annually to the comedian who, as determined by the judges, most exemplifies Lucy and Desi and the mission of the Center. The initial award will be presented in August 2011 during Lucy's 100th birthday celebration. The second Legacy of Laughter segment will be the Festival of New Comedy which will return the center to its roots when the likes of (then unknowns) Ray Romano, Ellen DeGeneres and Paula Poundstone played in Jamestown during the early Lucy Fest programs. "We want to get to the point where every up-and-coming comedian feels that they must play the Legacy of Laughter Festival in order to make it to the top," said Benson. Legacy of Laughter's third part will be a Short Comedic Film Festival that will inspire new artists to follow Lucy and Desi's footsteps and delve into comedic theater. The fourth will be the development of a comedic education program in conjunction with an accredited university that will have satellite programs in Jamestown and the surrounding region. Part of this program will focus on the healing power of laughter and will eventually provide services to local health care institutions. Plans are in the works for Lucy's 100th birthday celebration next August and details will be released over the coming months. In addition, a new robust website complete with social media and state-of-the-art merchandizing will be launched in about six weeks. The Lucille Ball-Desi Arnaz Center's purpose is to promote and develop comedy as an art form, including new forms of comedy, and the mission is to preserve and celebrate the legacy of Lucille Ball and Desi Arnaz and enrich the world through the healing powers of love and laughter. For more information on the Lucille Ball-Desi Arnaz Center, call 484-0800 or go to their website, www.lucy-desi.com. Laguna Playhouse's world premiere of I Loved Lucy, the stage version of Lee Tannen's book about his friendship with aging actress Lucille Ball, will star Diane J. Findlay as Ball and Jeffry Denman as Lee. Performances under the direction of Todd Weeks will play Oct. 5-31 in Laguna Beach, CA. Opening is Oct. 9. According to production notes, "Comedienne Lucille Ball left an indelible imprint on fans throughout the world, but most saw only the public persona. Now, go behind the scenes and get a glimpse of the personal side of Lucy. Few people knew America's comic sweetheart the way Lee Tannen did. Though distantly related by marriage and 40 years apart in age, Lucy and Lee became the nearest and dearest of friends during the last decade of Lucy's life. It was a time Lucy spent out of the spotlight and around a backgammon table, and Lee was lucky enough to be sitting across from her for much of that time." "Lee Tannen has a unique insider's knowledge of Lucille Ball," Laguna Playhouse artistic director Andrew Barnicle said in a statement. "He spent years as her friend and confidant, and he saw her through many of the ups and downs in the last decade of her life. Yes, she was a comic powerhouse. She was also stubborn, philosophical, affectionate, mercurial, vulnerable, and very human." Denman appeared in Off-Broadway's Yank! (for which he was a 2010 Drama Desk nominee) and Broadway's White Christmas, The Producers, Cats, Dream and 1995's How to Succeed in Business Without Really Trying. Findlay appeared in Off-Broadway's Flamingo Court, Paper Mill Playhouse's Funny Girl and Goodspeed Musicals' Dear World and They All Laughed. For more information, call (949) 497-2787, or visit LagunaPlayhouse.com. 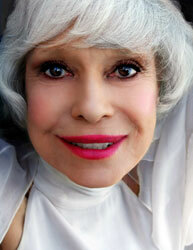 Los Angeles - Carol Channing has been performing on stage, in movies and on TV for most of her life. So as an accomplished entertainer she truly understands the value of the arts in the lives of youth. Carol and husband Harry Kullijian are embarking on a national campaign to bring the Arts back into the public school system - through The Dr. Carol Channing and Harry Kullijian Foundation for the Arts. Carol will be hosting the Spirit of 45 tribute to Veterans of WWII (Which her husband Harry is a veteran) on Saturday August 14 (the 65th anniversary of the end of WWII) at 800 Bringham Ave (West LA VA Campus off Wilshire) from 2 to 5pm. Also in attendance will be Carol's friends Rhonda Fleming and Margaret O'Brien. Carol Channing will release a new Patriotic-themed CD, tentatively titled American Carol in September 2010. Among the songs featured will be "Over There," "Dear Old Glory," "God Bless America," "America," and "The Battle Hymn of the Republic." Channing won the Tony Award for Hello, Dolly! and also appeared on Broadway in The Vamp, Lend an Ear, and Gentlemen Prefer Blondes. She received an Oscar nomination for Thoroughly Modern Millie. Channing also recently released the CD, For Heaven's Sake, which includes spirituals, hymns, and rousing gospel tunes. The actress will be making a number of upcoming appearances as part of a national campaign to restore the Arts back into the public school system through The Dr. Carol Channing and Harry Kullijian Foundation for the Arts. She will appear in Denver on August 6 before the national PTA, followed by a San Francisco panel discussion on August 8 with friends Rich Little and Steve Rossi for Comedy Talks, then on to Los Angeles where she and Kullijian will co-host an August 14 event for Spirit or 45' honoring US Veterans of WWII on the 65th anniversary of the end of the war. Channing also recently produced a PSA for California in conjunction with the PTA to speak out in support of the need for the Arts in the public school system. It featured friends and colleagues Lily Tomlin, Alec Mapa, Florence Henderson, Kevin Sorbo, Donna Mills, Lesley Ann Warren, Stefanie Powers, Kate Linder, JoAnne Worley, and Phill Lewis. Another is being planned for national distribution. For more about Channing's national efforts, visit www.ChanningArts.org. This is the original article. 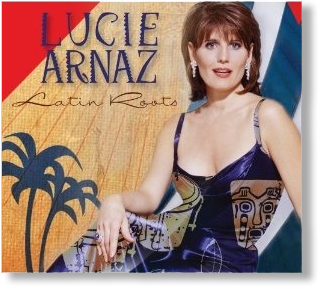 Infectious is the first word that pops into my mind to describe this collection, only the second solo outing by the fabulous Lucie Arnaz. Ms. Arnaz is, of course, the daughter of legends Lucille Ball and Desi Arnaz, who rose to fame during her memorable stint on her mother’s sitcom "Here’s Lucy!" and celebrated her Broadway debut in the Neil Simon/Marvin Hamlisch/Carole Bayer-Sager musical They’re Playing Our Song. I had the pleasure of watching her perform a couple of the numbers from this album at the recent MAC Awards, and can attest that time has done nothing to dim the voice and look of this remarkable performer. This CD is a valentine to her father, and Ms. Arnaz evokes fond memories of time gone by, while adding her own unmistakable stamp to several of the songs made famous, or famously rendered, by her dad. She slips effortlessly between English and Spanish, bringing to life such gems as “Blame it on the Bossa Nova” (with a new third verse written by Bary Mann and Cynthia Weil just for her) and “I’ll See You in C-U-B-A.” The opening, “You and the Night and the Music,” perfectly sets the mood for the delights to come, and there are many! I found a particular thrill in hearing that voice, untarnished and potent as ever, that I fell so madly in love with as a child devouring Broadway cast albums in Lexington, KY, tearing into these treasured songs! Ms. Arnaz has the infinitely pleasing sound of a Helen Reddy or Karen Carpenter, and I have always wished she had provided more for our enjoyment. However, this collection does more than make up for her lack of content in the ensuing years. Particuarly pleasing are versions of the now-standard pop hit “Johnny Angel” (which was, by the way, the moniker of our local gay disco!) which she turns into a tender ballad of longing set to a gentle Bossa beat, and her lovely take on the famous Dan Fogelberg creation “Leader of the Band,” which, as she astutely states in the liner notes, seems written just for her! This fantastic band is led by Ms. Arnaz’ longtime collaborator Ron Abel, and in addition to some fresh and fun reworkings of the classic tunes included here, is one of Mr. Abel’s own compostions with lyricist Chuck Steffan (“Just To Be Near You”) and another penned with Arnaz’ son Joe Luckinbill, with lyrics by Ms. Arnaz and Madeline Stone (“The Music In Your Heart”), both immensely enjoyable. Bouncing back to the MAC Awards show for a moment, I must add that joining the sleek and sassy Lucie Arnaz onstage was the incompable award-winning singer/songwriter Billy Stritch, who dreamed up the simply mesmerizing entertwined arrangement of “It’s Alright With Me/Something’s Gotta Give,” which the two of them jointly (live and here) give something that’s more than alright with me! Highly entertaining as well, is a spirited take on “Promises” by Polish songstress Basia (whose catalog I simply must investigate further!) and the inspired pairing of Desi’s signature “Babalu” with Desmond Child’s “La Copa de la Vida” (who knew?). This winning album is a highly entertaining, spirit-raising and touching tribute by the endearing Lucie Arnaz to the endearing legacy of her famous and famously talented father. BTW, be sure and listen for our very own Raissa Katona-Bennett and Dr. Garrett Bennett amongst the lively backup singers! A planned one-hour interview with a light-hearted but still serious Yolanda Brown easily lasts two hours in the dormant-for-the-summer classroom where she teaches art at Dublin’s Davis Middle School. Next Nov. 4, she’ll be honored as middle school art teacher of the year by the Ohio Art Education Association at its annual meeting in Columbus. Quickly she points out that it’s a shared honor this year and that Mary Baine of Baker Middle School in Fairborn is the other honoree. Yolanda’s says only a handful were nominated. Written descriptions of art education, its goals and significance, often are not quite as revealing as is a chat with Yolanda, whose relaxed demeanor and candid conversation reveal the charm and dignity she brings to her charges, their parents and the Dublin school system. Talking with Yolanda, who has a master’s degree in art education from Miami University, reveals who she really is and what she’s about in a half-dozen classes a day for sixth and eighth graders. 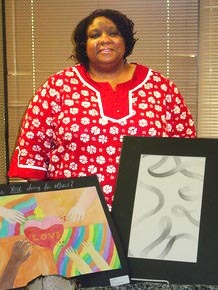 First and foremost, she sees art as a valuable tool in school and life, regardless that a person is not an artist. For her art is fun, something she has done since childhood, beginning with making coal chalk marks on her grandparents’ sidewalk. She notes that art impacts us in many ways by depicting history, in Power Point presentations, advertising, exhibitions, home decorating, the list goes on. She works in a multi-cultural environment. “The world has come to this school,” says the native of Dayton. Students and their parents speak over 40 languages, she says, before a roll call of countries represented, including China, Korea, India, Pakistan, West Africa and the Middle East. At the beginning of the school year, she will ask students from each country to write on the blackboard “all the different ways they can say hello.” Fellow students “can learn from them, hearing different accents.” Some foreign students grow frustrated that the “English ear” keeps Americans from saying their name as it’s pronounced in their native tongue. Yolanda says she “can communicate with pictures so they get some degree of knowledge.” Youngsters find a commonality in drawing a picture of a house. Art, she finds, helps bolster their language learning efforts. She wants student to realize that their art should be something that’s understood in Taiwan. “Your grandmother has to understand,” as she mentions the universal language of art that’s created and appreciated internationally. She teaches watercolor, acrylic, clay, acrylic mediums and is “very heavy on color pencil drawings.” Some projects are 3D, or sculptures, perhaps involving a combination of mediums. She makes it fun, saying she wants the kids to “find joy” in the arts, in life. She sings songs she makes up. “They’re horrible, horrible songs,” she admits with a typical big smile. One for instance, is about the “Binder Bin,” a storage place on each desk that’s to be used so there’s nothing on the desktop where artwork is done. Yolanda concedes she’s also demanding to the point students have said, “You’re mean.” Because she finds art so important, she says getting it right “is like getting ready to go on a trip to another country,” in that they’ll be heading to high school where 40 to 50 percent of her students will take at least one art class. She notes with pride that Scioto High School, next step for most of her students, has one of the top arts programs in the state and it produces numerous winners in state exhibitions each year. Her classes, she feels, are “98 percent fun and learning. We should be having fun and you should be learning.” Yolanda’s disappointed that sometimes parents don’t want youngsters to bring home their artwork because it’s “too messy,” regardless that it’s a child’s self-expression. When asked, she fills in a few bits of information about her life, which has centered around the arts since she started going to classes at the Dayton Art Institute at age eight. Quickly she provides a vita that goes on for two pages about her extensive activities in the arts. She briefly breezes though high school where she took woodshop and metal shop besides the usual courses. She went to Wright State University to study computer science but didn’t like it and quit after a year. Next stop was Sinclair Community College before earning her bachelor’s degree in fine arts and literature from Goddard College in Plainfield, Vt. She applied to a half dozen colleges to study for a master’s degree and decided, “The first letter I get, that’s where I’m going.” It was from Miami in Oxford, Ohio, not far from home. In Oxford she was a full-time substitute high school art teacher and an adjunct instructor at the university with classes in women’s studies. Naturally, she taught some too at the university’s art institute. All the while, she continued creating artworks and having exhibitions. “I just couldn’t seem to get out of Oxford” where she also did some class work preparatory to seek a doctorate. Other aspects of her own art education involved working with several mentors. She notes that “Einstein was a violinist. Tony Bennett’s a painter. We’ve got to keep the arts. I teach art. I like teaching art. I’m good at it,” she says smiling broadly. She wasn’t boasting. She didn’t have to. It’s obviously the truth about this dynamic woman who’s dedicated to her profession, to the arts as important parts of all aspects of life – and her young students. After little more than a year at the helm of the Lucille Ball-Desi Arnaz Center, Corie Curtis, a Falconer native, has stepped down from the post. The center's board of directors announced the change in a news release Wednesday. Thomas P. Benson, board president, said the center has undergone an internal restructuring and cross-training of staff, daily operations are running efficiently and the center's recent and upcoming activities are evidence of its vision to create a comedy movement in the area. "The center has made significant progress the past year," Benson said, "and that progress includes a renewed commitment to our purpose of promoting and developing comedy." Ms. Curtis holds a degree in advertising and communications from Johnson & Wales University in Providence, R.I. For three years until 2008, she served as the volunteer executive director of the Feed Their Dreams Children's Foundations. She has also worked as a member of the Council for the Advancement & Support of Education and, in 2004, served as the fundraising consultant for the Rhode Island Hospitality & Tourism Association's capital campaign. "My time at Lucy-Desi has been an unforgettable experience and I am grateful to have had the opportunity to work with and for such capable and kind people. Professionally, my departure from this amazing career was a very difficult decision, but my heart is leading me on to an entirely new adventure," Ms. Curtis said. Ms. Curtis' departure is the latest in a turbulent couple of years for the center since the departure of Ric Wyman in September 2008. The center was forced to close its gift shop, a building on North Main Street that is now up for sale, and consolidate operations into two other buildings on West Third Street. Hours at the Desilu Playhouse and museum were reduced and several employees were laid off as part of the board's efforts to trim expenses and keep the center afloat. Lucie Arnaz-Luckinbill, daughter of Lucille Ball and Desi Arnaz, said the center is still going strong and wished Ms. Curtis well in her future endeavors. "Corie has been a godsend and the center has never been stronger,'' Ms. Arnaz-Luckinbill said. "We hate to see her go follow other dreams and even tried locking her in her office. But we were finally convinced even the best of our leaders deserve to explore the possibility of true love! My brother Desi and I wish her only the best and look forward to the new ideas and renewed energy that change always brings." After nearly a year at the helm of the Lucille Ball-Desi Arnaz Center, Corie Curtis has stepped down from the post. If you love Lucy, this one-woman show is for you. "An Evening With Lucille Ball: 'Thank You For Asking,'" is part of the Meadow Brook Music Festival in Rochester. The July 24 show promises to bring the "Queen of Comedy" to life thanks to the efforts of actress Suzanne LaRusch and Ball's daughter. LaRusch wrote the play with Lucie Arnaz Luckinbill, and audiences will be treated to many memorable moments, including what inspired those unforgettable "I Love Lucy" sketches and a glimpse into her fiery and complex marriage to Cuban bandleader Desi Arnaz. The show is in the form of lectures Ball loved to give throughout her career. LaRusch has been doing Lucy impersonations since 1991, for theme parks, corporate parties and shows. In 2006 she had her "light-bulb moment, (and) I came up with the present formula, which is the question and answer because she did (those)," LaRusch said. "That's how I tell her story"
LaRusch cautions audiences against expecting an evening of greatest hits. "It's a play. We do questions and answers as if it was happening in that moment in time, but since it's a play (the voices are) recorded. You'll see me onstage saying, 'OK, how about that lady in the back ... I'm sorry, the gentleman ...,' " which are lines Ball actually said. LaRusch counts herself a fan of Ball, but "no more than anyone else. She's a beloved icon and comedian. I've been a fan of her comedy. I'm an actress, so I'm not a Lucy fan that had to 'be' her." LaRusch sought the advice of Ball's daughter to "get the essence of Lucy." "She had great input, so I asked her to direct," LaRusch said about the show which came together in 2006. Arnaz eventually said yes, changing and tightening the script, "adding family intimacies and secrets." But "it's not favorite skits at all," LaRusch said. "If you want to see 'Lucy' skits, then buy a DVD. But if you want to know the stories behind those famous skits, come and see my show (and find out) what made this lady tick." What are some of the revelations? "You have to see the show to get a couple of the big ones," LaRusch teased. She won't give answers but she'll share such questions as: "Was Desi Arnaz the love of your life?" In the show, "you find out how she really felt." The show offers a behind-the-skits perspective. "We do Vitameatavegamin as a flashback" because people always ask about it. Also revealed: What Lucy was really drinking in that skit. Another revelation is the infamous chocolate factory scene. "We tell the story behind the candy and find a clever way to work in the candy without having a conveyer belt on stage." Also, did she really eat all those chocolates? Listen and learn. Also revealed: Ball's favorite episode, and it didn't involve grape-stomping, chocolate overload or Vitameatavegamin. "An Evening with Lucille Ball: 'Thank You for Asking'" comes to Meadow Brook Music Festival on the Oakland University campus in Rochester Hills at 8 p.m. July 24. Tickets are $22.50 reserved pavilion and $15 general admission pavilion at Palacenet.com, The Palace Box Office and Ticketmaster locations. Special Superfan seating is available. Tickets may also be charged by phone to American Express, Discover, Visa and MasterCard by calling (800) 745-3000. A California auction house selling LUCILLE BALL memorabilia has reached a deal to return the late acting legend's lifetime achievement awards to her daughter. Ball's daughter with first husband Desi Arnaz, Lucie Arnaz Luckinbill, was left items including love letters, a Rolls Royce and trophies from the star's acting career in her mum's will when the comedienne died in 1989. However, the widow of Ball's second husband, Susie Morton, claimed Luckinbill failed to collect the items following Ball's passing, and planned to sell them off at Heritage Auction Galleries over the weekend (17-18Jul10). Luckinbill threatened to take legal action over the auction of her late mother's personal items because it "insults her memory". Auction bosses stepped in, and agreed on Saturday (17Jul10) to return the awards to Luckinbill, but the other items remained in the sale. Luckinbill plans to display the trophies in a museum honouring her mother, reports the Associated Press. Lucille Ball’s daughter tried to stop her stepmother from selling family heirlooms at an auction. In court on Friday, the judge agreed, but Los Angeles Superior Court Judge Robert O'Brien ordered Lucie Arnaz Luckinbill to pony up a $250,000 bond to get her restraining order issued against Susie Morton, according to the Associated Press. Luckinbill’s attorney, Ronald Palmieri, called the decision “very sad” and said his client could not afford that amount. “We won on a legal basis, and the judge took it away from us on an economic basis," he said. 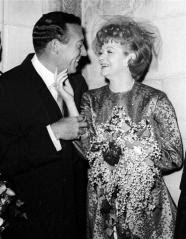 Luckinbill is the daughter of Ball and her first husband, Desi Arnaz. Morton is the surviving widow of Ball’s second husband, Gary Morton. between Ball and Arnaz, a Rolls-Royce and photographs. Luckinbill said she wanted to donate the items to a museum exhibit. According to the Internet Movie Database, Ball, who died in 1989, was not only a comedy star but also a film pioneer. She became the first woman to own her own television studio, which she called Desilu. LOS ANGELES - July 16, 2010 — Heirs of the late Lucille Ball and her second husband are sparring over the planned auction of the some of the couple's prized possessions. Among the items on the auction block are love letters between Ball and Gary Morton, a Rolls Royce and some of the actress' awards. Morton was the comedienne's second husband. The items were consigned to Heritage Auction Galleries by Susie Morton, who married Gary Morton after Ball's death in 1989. Ball's daughter from her first marriage with co-star Desi Arnaz wants some of the items returned. An attorney for Lucie Arnaz Luckinbill says she will go to court Friday to try to block the sale if the items are not returned. Susie Morton asked a judge Monday to determine that she has the right to offer the items for auction. I became a major Lucille Ball collector when I moved to New York in 1983 and have since become recognized by many as having one of the largest "Lucy" collections around. Some of you may remember me from A & E's Biography when they did their tribute to Lucille Ball & Desi Arnaz. Many stills and photos of mine are in that tribute as well as a few segments of my interview. That biography only aired once, Thanksgiving night, 1994. Copyright © 2011 by Glen Charlow Desktop Publishing. Powered by Blogger.